Welcome to Debate Team Scholarship Fund Project! 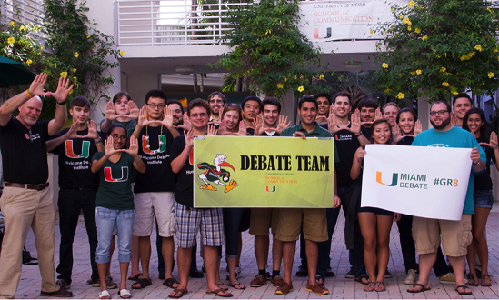 The UM Debate Team is nationally ranked and respected. Students on the team work incredibly hard on debate preparation and use several hours a week of their personal time to ensure they are ready to represent UM in debates nationwide. Despite putting in a lot of effort and representing UM in a positive manner, these students do not receive any scholarship funds or course credit. The existing Debate Team Scholarship Fund has supported students on a merit basis since its inception in 2016. We would like to grow this scholarship fund even more to provide more substantial merit-based scholarships to students who are experienced in debate and can help the UM Debate Team continue its success. Debate Team Scholarship Fund campaign has now begun! We appreciate your participation! Mr. Ronald W. Sabo , Esq.